Since it is Jason Fladlien‘s birthday, he is treating all his customers with free training and products that the Rapid Crush team has released over the years. The mechanics are pretty easy, pick the product you love the most from the list, and you’ll qualify to pick another product (of equal or lesser value) for FREE. 3. You can’t ask for a refund if you’ve purchased one of these products before just so you can take advantage of the Buy One Free One promo. The promo ends on Monday, April 8, 2013, 12 PST. 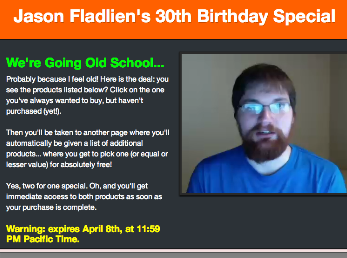 Hurry and take advantage of this rare Jason Fladlien promo.